At the 2012 NAMM Show, Roland and Fender announced the GC-1 GK-Ready Stratocaster guitar as one of the V-Guitar series, am electric guitar that can be directly connected to the GR-55 Guitar Synthesizer and VG-99 V-Guitar System. Combining an authentic Stratocaster guitar and a special Roland divided pickup with a 13-pin output; the GK-Ready Stratocaster GC-1 can be used with both standard guitar equipment and Roland V-Guitar category products like the GR-55 and VG-99. To harness this power, Roland developed the GK Divided Pickup, a special pickup that allows each of a guitar’s strings to be processed independently. Connecting a GK-Ready guitar to the GR Guitar Synthesizer or V-Guitar System opens up a world of options, including instant alternate tunings, transforming the guitar sound into another instrument entirely, and more. 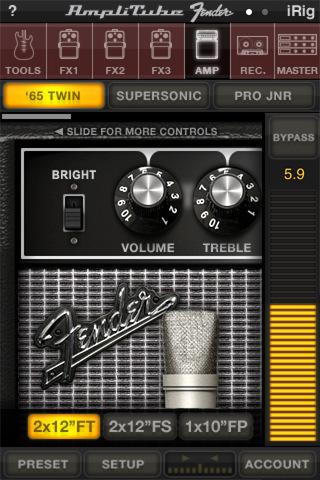 IK Multimedia has announced that AmpliTube Fender (App Store link), a full-featured Fender Tone guitar rig with built-in recording and practicing studio, is now available for iOS. Use the AmpliTube iRig interface adapter to connect your guitar to your iPhone/iPod touch/iPad and you’re ready to practice, play and record with that Famous Fender tone everywhere you go.